BINGHAMTON, N.Y. – The presence of an invasive species in an ecosystem makes native organisms more susceptible to pollutants and may encourage the spread of additional invasive species, according to new research from Binghamton University, State University at New York. Binghamton faculty, along with graduate and undergraduate students, examined the effects of native vs. invasive plant leaf litter and sodium chloride on two amphibian species: the northern leopard frog, which is native to the United States, and the African clawed frog, which is not indigenous and considered invasive in some areas of the U.S. The researchers found that growing up in water with invasive leaf litter accelerated developmental time and reduced the mass of the native leopard frog, but had no effect on the invasive African clawed frog. They also found that northern leopard frog tadpoles raised in water with invasive leaf litter were more susceptible to road salt, but African clawed frog tadpoles raised in water with invasive leaf litter were less susceptible. This research represents a collaboration between the research lab of Assistant Professor of Biological Sciences Jessica Hua and undergraduate students enrolled in a course taught by George Meindl, Assistant Professor of Environmental Studies. 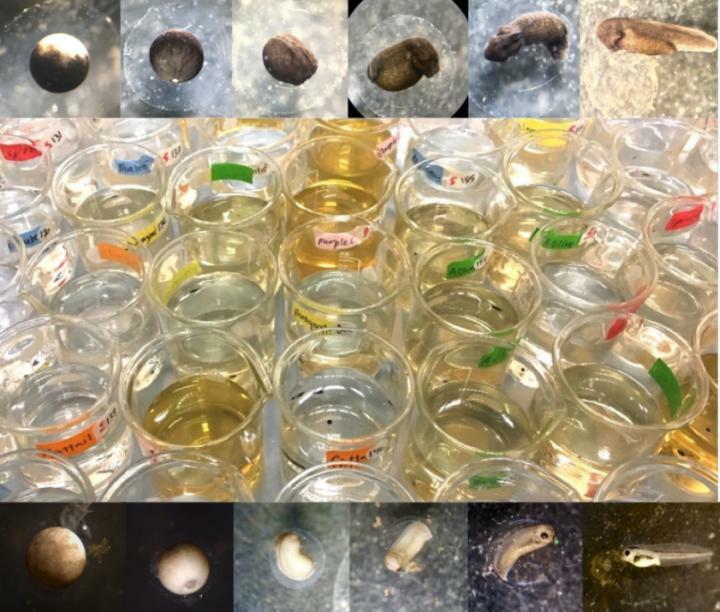 "Collectively, our findings stress the importance of considering interactions between multiple stressors in order to understand the impact of invasive species and to preserve native biodiversity," Meindl said. Devin DiGiacopo, PhD student, said invasive plant species simply dropping their leaves into surrounding water bodies was enough to modify the aquatic environment in ways that harm some species but benefit others, especially in the presence of other stressors, like road salt. "Specifically, by altering the chemistry of aquatic environments, we found that invasive plant species increased the success of an invasive species, but harmed the native species," DiGiacopo said. "These results are consistent with the invasional meltdown hypothesis, which suggests that the presence of an invasive species may actually encourage the spread and establishment of other invasive species." The team is currently working on adding experimental complexity that allows amphibians to reach later life stages (through the use of outdoor mesocosms) and incorporating coexisting native and invasive amphibians, enabling more natural ecosystems to be assembled. This may provide a more realistic assessment of the effects of both plant leachates and salts. "There is more work to be done," Hua said. "This study examined two amphibians and six plant species — future studies that consider the generalizability across additional species are critical." The article, "Interaction between invasive plant leaf litter and NaCl on two model amphibians," appears in Biological Invasions.